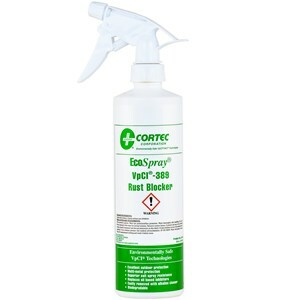 Cortec ECO Spray 389 Rust Blocker is a water-based coating to rust-proof iron, steel and other ferrous metals. Prevents rust in areas where outdoor corrosion protection is needed. Effective, non-hardening film. Multi metal protection with superior salt spray resistance. Will replace oil based inhibitors and is easily removed with alkaline cleaners. 16 fl. oz. pump spray. EcoSpray products attack the toughest maintenance duties with respect for the environment. They incorporate nontoxic, biodegradable chemicals without aerosols, propellants, or ozone-depleting CFCs. Fast-acting, dependable, and safe to handle, EcoSpray products lead the way in environmentally safe technology. Cortec EcoSpray products do not contain propellants, CFCs or HCFCs that affect the atmosphere, ozone layer or environment. When possible, EcoSpray products are formulated with ingredients rated for their biodegradability and non-polluting characteristics, minimizing waste disposal. EcoSpray products are non-hazardous and can be shipped by air freight or any other conventional shipping method. EcoSpray products are packaged in 16 fluid ounce (0.5 liter) recyclable bottles.